Sorry: Mobile get powers not yet activated..
Flashrank is not working to mobile?? For this I can't buy?? Please don't closed my topic..
Where my question was not answered .. I buy powers "hats" and "glitch" in store for my mobile.. The not answer to my question for closed my topic.. There is no "mistake" in the purchase. Just read the message and see that you are not able to buy powers through mobile yet. 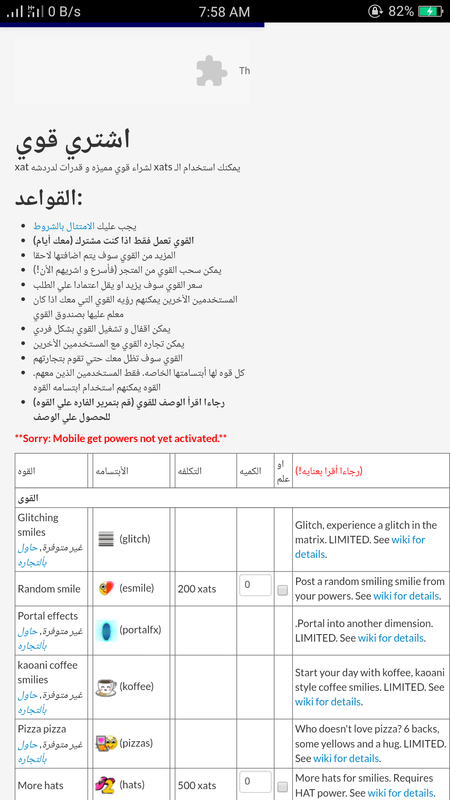 If you read the red message, it says ''Sorry: Mobile get powers is not yet activated.''' meaning that you cannot buy ANY power from the store on Mobile. How can't buy any power to mobile. Is this a new update today or what? Actually, this is an error from the administrators, nothing is disabled. Actually﻿, this is﻿ an error from the administrators, noth﻿ing is disabled.